REDIFFUSION is a frottage piece made by Mandy Pegg as part of ‘Involuntary Painting 1 New Parks : New York’ in New Parks, Leicester, March, 2015. It forms part of The King Richard III Municipal Covers Memorial Collection produced by the New Parks contingent of IP1NPNY after first engaging with works by Max Ernst. The IP1NPNY project also includes a group of artists in New York who exchange comments, involuntary paintings found in New York and encouragement with and for the New Parks group. ‘REDIFFUSION’ is a frottage piece, a series of rubbings essentially of service covers for cable television services. 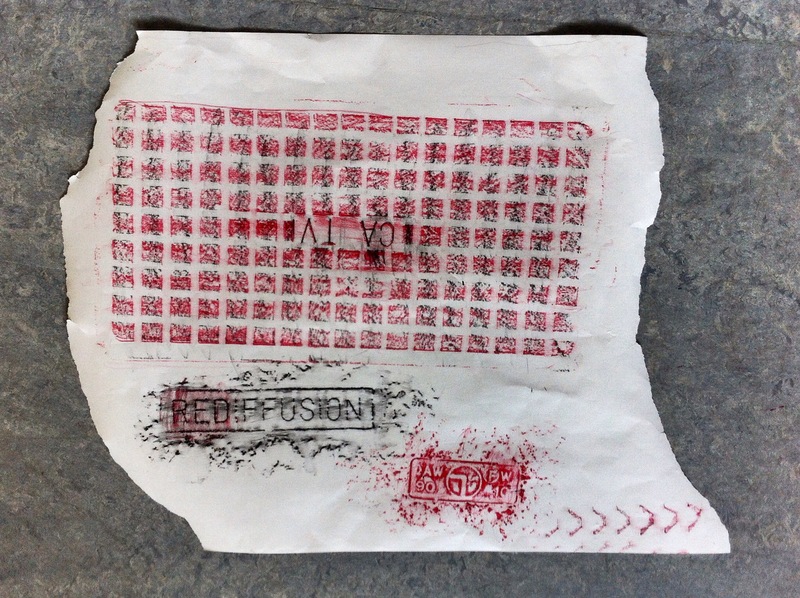 It is not merely a straight rubbing, Mandy Pegg chooses to place two rubbings together and to use more than one colour wax, red and black. We see the ‘RED’ of ‘REDIFUSSION’ highlighted in red over the black. It is a voluntary artwork out of features, metal service covers, initially identified as an ‘involuntary painting’. Involuntary Painting 1 New Parks : New York is a project conceived by artists Millree Hughes (New York, USA) and Paul Conneally (Loughborough, UK) with and for Soft Touch Arts and New Parks Library with support from Arts Council England. These mistakes are what Hughes and Conneally call ‘involuntary paintings’. Surfaces and objects marked by time, mould, human and natural activity as stand-ins for the pigment, ground, support etc of voluntary painting, voluntary art.